With this EA you can say goodbye to your coder and save bucks from your pocket! Did you find out an interesting holy grail indicator and you want to test it on your own? Eager to know if it will be profitable on long term? Well, here it is the Koder Killer EA. run your EA on live servers paying a small rent fee. All of these features will help to find the best setup for your indicator... It is a value added, something that any coder will ask to pay for any single function added to your EA! A well-coded indicator must return zero or empty value 2147483647 (0x7FFFFFFF) on normal running. At this point, once the conditions are matching and the arrow appears, the buffer will return a different value (usually the price value). At the same time, the EA will recognize a mismatch between zero or empty value and buffer value and will open an order accordingly. You can double check this procedure by running a visual backtesting: on the top-left corner of the chart, you will see the returned value of the indicator (check the screenshots attached). 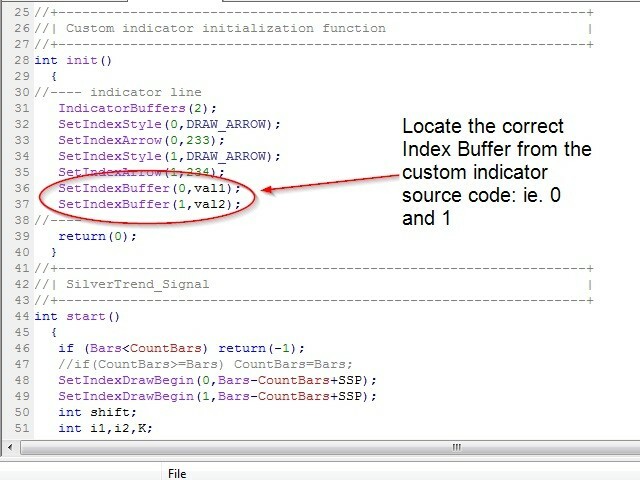 Last but not least, in order to enable your custom indicator, make sure you use the following MagicNumber: 20151119, otherwise the custom indicator will be disabled. 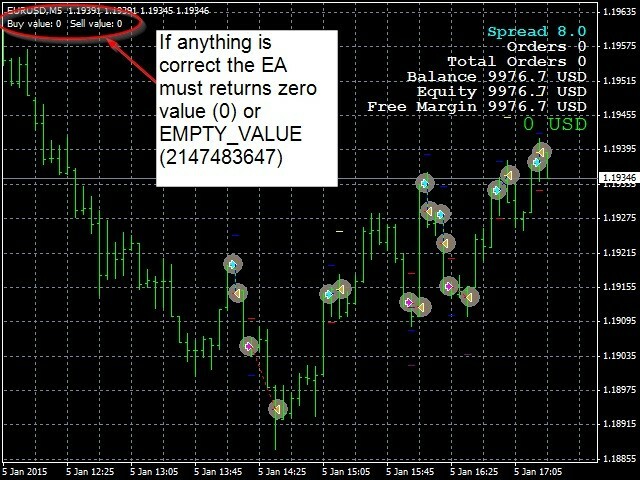 Some custom indicators are very complex and will not run with this EA, but will be very useful when you have simple indicators with BUY and SELL buffers. At least you can try for free, and if it does not work, you just spent your time and not your money! Use_Stochastic_cross - filter by Stochastic cross (buy if Stochastic Main > Stochastic Signal and sell if Stochastic Main < Stochastic Signal). This is an excellent product. I forgot I had purchased it to be honest but have recently been testing it with various paid indicators and it works well, as long as the indicator buffers (usually 0 or 1, but could be 2 and 3, or 4 and 5) for your indicator signals have been programmed correctly. I have probably gotten it to work with 80% of my custom arrow based signal indicators. It's also great to check if an indicator repaints, from my testing where I can see the buffers for arrow signals in the code, if the indi repaints the EA won't trade. 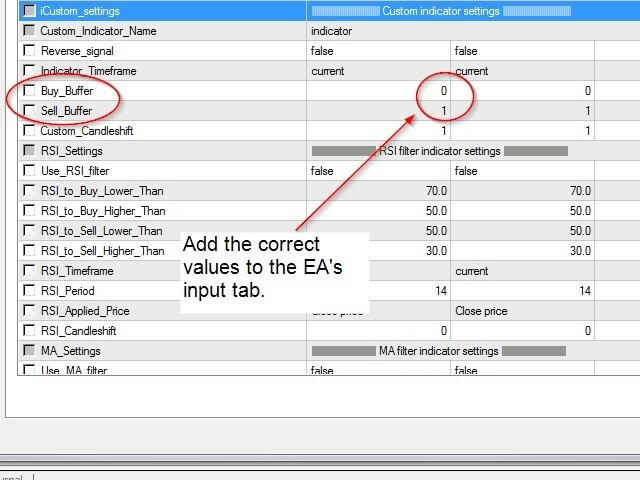 It's not perfect - you would have to change the default values of the custom indicator (if you have the source code) within MetaEditor, there is no way of assigning values to anything, but that's not a big deal and certainly not the fault of the EA developer. Remember to add an extra zero to settings like stoploss for ECN brokers (do 4 digit brokers even exist anymore?). For example, a 30 pip stoploss should be 300 in the settings. Finally, backtesting tends to be slow. This is not unique to this EA, it seems that this way of forcing a custom indi to trade as part of an EA without coding does not make MT4 happy. I blame MetaTrader 4's lack of multithreading for the CPU load, so the backtests can be much slower than what you are used to. In conclusion, this is a brilliant product that enables you to prototype/test indicators as candidates for coding/paying a developer to make you a strategy. I am aware of two other competitors and this is cheaper than both of them, so I strongly recommend this product, although it's probably going to be hard to use for new users of MT4 who do not understand any code at all. Note: I cannot program MQL but I know what to look for in the code, this is quite important to be able to use this EA. Download the demo and try it, you'll learn a bunch of stuff in the process and get to test some of your favorite arrow signal indicators at the same time! - Fixed comment on chart with Custom indicator value (now show-up only if custom indicator is enabled). - Fixed a bug on Custom indicator SELL function.